When should you expect to be paid? Please take a look at the calendar above. Our pay period begins on Monday and ends Sunday. If you are on direct deposit or pay card, everything worked during this time will be issued out on the following Friday. If you are on paper check, you can expect your check between the following Friday and Wednesday. It’s important to look at the dates so you don’t get confused on when to expect your next check. 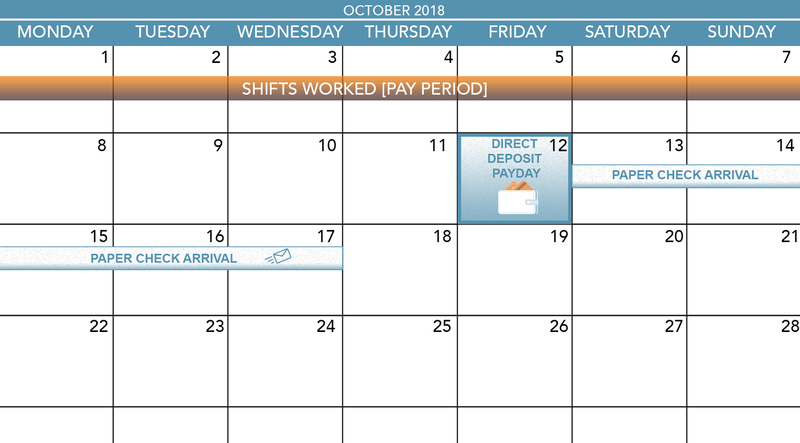 In this example, you see that our pay period began on Monday the 1st and ended on Sunday the 7th. If you have direct deposit, this means that the work done between these dates will be issued on the following Friday the 12th. It’s important to note that it’s a repetitive process. After the pay period ends on the 7th, it begins again on the Monday 7th and ends on Sunday the 14th. If your check doesn’t arrive by Wednesday of the following week, please write into Support. We highly recommend all crew members sign up for direct deposit or pay card to get paid faster.